The Devils of the Gothic Quarter were born in 1984 as the Devils of Sant Roc, they are, therefore, one of the most veteran devil dance groups in the city of Barcelona. Their official presentation, however, and its baptism of fire was the Feast of Sant Roc de la Plaça Nova. Their godparents, and responsible for their baptism of fire, were the Ball de Diables del Clot and the Colla de Diables de Sants. A year later, following the tradition of other gangs of Barcelona to identify itself with the neighborhood, they become the Devils of the Gothic Quarter. While retaining the old name of Devils of Sant Roc for its intervention in the procession of the Holy Parade, every August 16. In this representation they serve a similar function to that of the "diablons" of Corpus Christi. 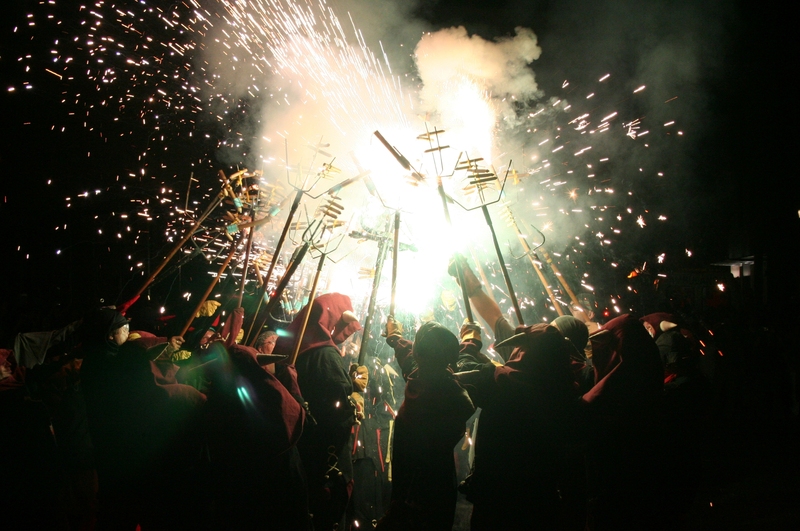 During the early years they act as a classic devil dance inspired by the "diablots" of the Corpus Christi procession in Barcelona; but soon evolved towards the so-called Barcelona model of "correfoc" and fireworks spectacle. Alone, or accompanied by the Víbria of Barcelona and/or the Arpella, its "correfocs" and spectacular endings are synonymous with celebration, tradition and innovation, of fire culture in the purest festive essence. The Colla de Diables del Barri Gòtic has enriched the tradition of fire by building fire beasts. In 1989 the Eagle of Old Barcelona was recovered, which until 1992 was igneous -launching fireworks from its beak and tail-. In 1993 the Vïbria of Barcelona was born, the ​​female dragon, that forms part of the Historic Bestiary of Barcelona and is integrated in the Procession of the City. Alone, or accompanied by the Víbria of Barcelona and/or the Arpella, its "correfocs" and spectacular endings are synonymous with celebration, tradition and innovation, of fire culture in the purest festive essence.